In enterprise environments, desktop hardware configurations tend to be standardized, and are usually limited to at most a handful of different setups that will be deployed for various job tasks or roles. 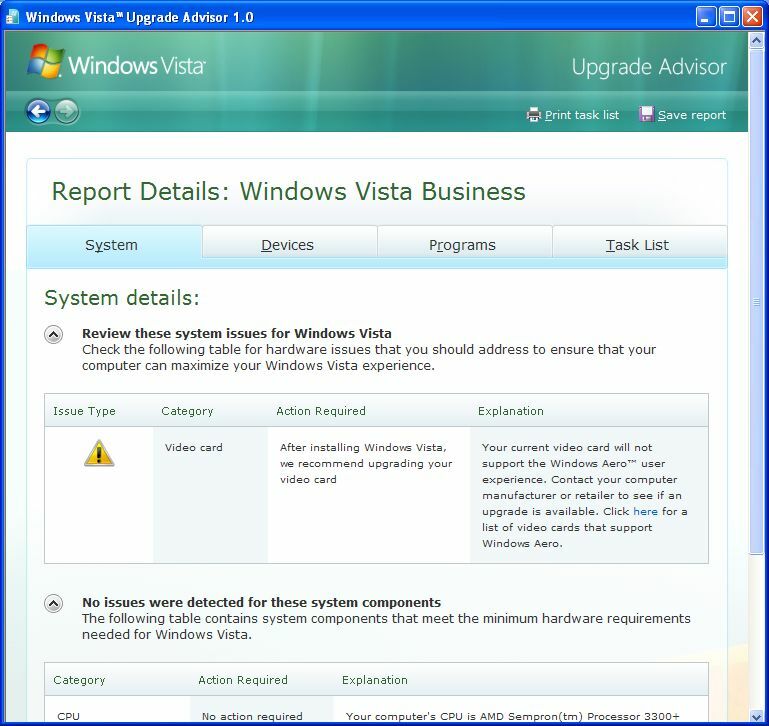 For companies and organizations considering a move to Windows Vista for those machines it might be wise to download, install, and run the Windows Vista Upgrade Advisor on sample machines that match deployed configurations. The program comes packaged in a 6.6 MB file named WindowsVistaUpgradeAdvisor.msi, and sets itself up using the standard Windows Installer. 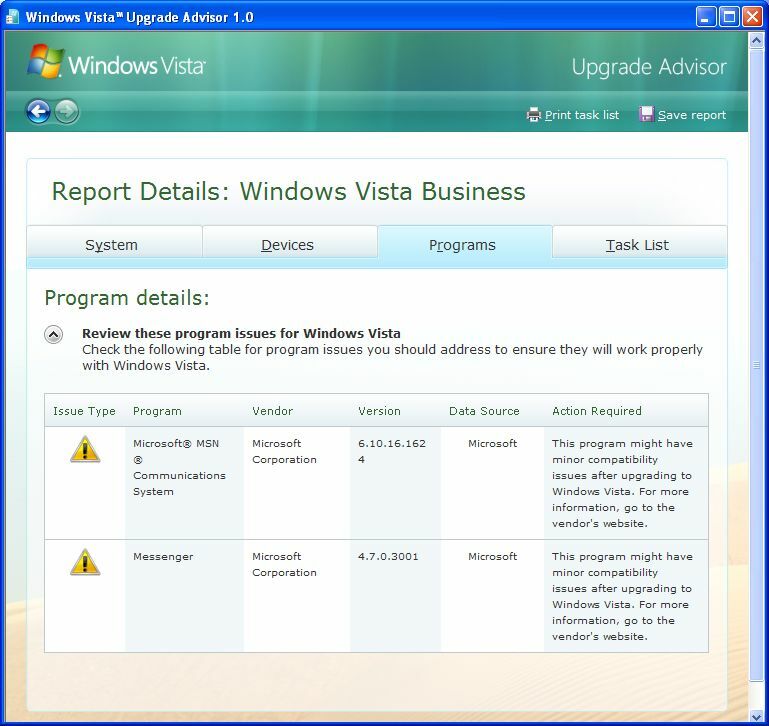 Typical installation time is under two minutes, and the program requires Windows XP SP2 or better (it also works with Windows Vista; I checked). Other supporting software elements that must be present include .NET Framework 1.1 or newer, and MSXML 4.0 or better. Installing the program is a snap and simply demands clicking through a handful of screens to accept a EULA, selecting a target directory, then managing startup and desktop icon options. When you install and run the program on a target machine, it will usually take at least a couple of minutes to complete. 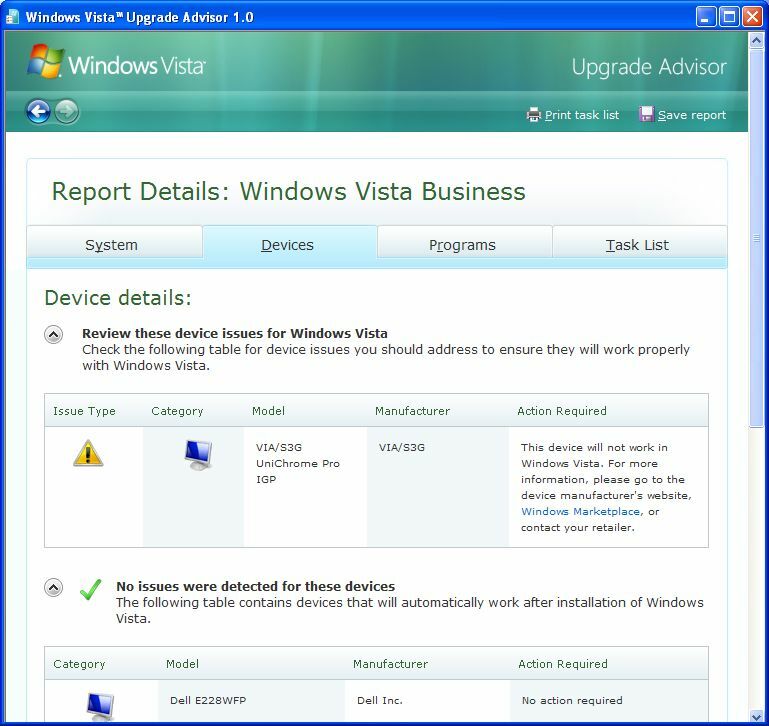 In the background the software is enumerating all devices and software on that machine, and comparing them to a database of Vista compatible (and incompatible) items. The best possible outcome for the scan is depicted in the next screenshot. Of course, this resulted from a put-up job deliberately designed to pass with flying colors. On an older more typical desktop running Windows XP SP3 with 2 GB RAM, Sempron 3200+ CPU, and integrated graphics, the results were a bit less exhilarating: warnings showed up in all three categories that the Upgrade Advisor checks: System (the computer system itself), Device (adapter cards, drives, and other devices inside the PC), and Program (software running on the target machine). The next three screenshots illustrate each of these reports from the Upgrade Advisor. When it comes to dealing with the items reported in the Upgrade Advisor’s detail sections, it’s important to formulate a strategy for accommodating or overcoming those results. For example, if users don’t need the Vista Aero theme and its graphics razzle-dazzle, upgraded machines can be configured using Sysprep or some other image construction and deployment tool to turn off that resource-intensive capability. On the other hand, for users that need more capable graphics performance, one could replace an existing graphics adapter or (as would be the case for this test target platform) install a graphics card thereby disabling its older and less capable integrated graphics. The same type of approach generally holds true for both devices and software, with the possible exception of legacy or custom appliications that users simply must run. 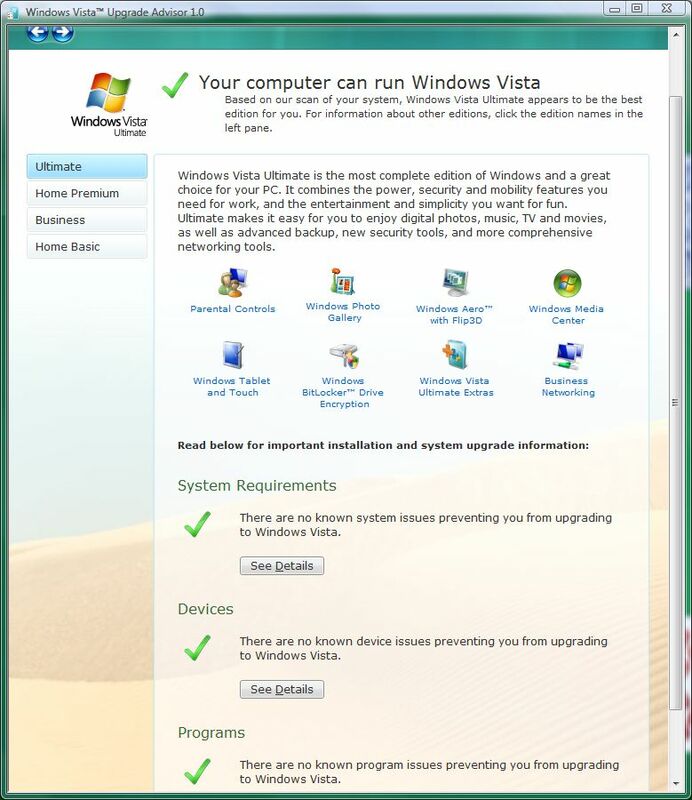 For such items, if all else fails, remember that you can install older Windows operating systems in Virtual Machines (VMs) running inside Windows Vista, as a next-to-last resort for keeping such items operational (the last resort is to set up a server or target machines elsewhere on the network that Vista users can remote access into). The target XP machine on which I chose to run the Upgrade Advisor gets a suprisingly clean bill of health from the software. My own experience has been that Vista runs best on a dual-core processor or better, works best with at least 2 GB of RAM, and requires an Nvidia 7600 or AMD/ATI 2400 graphics card or better, for even minimal and acceptable use. It’s important to bear such observations in mind when pondering how to react to the Upgrade Advisor’s reports and recommendations. Otherwise, end-users may wind up with painfully slow desktop systems. Once you’ve decided on an upgrade strategy, it’s probably wise to upgrade a small group of machines, place them with a hand-picked set of at least moderately knowledgeable users, and let them try out the new gear for two to four weeks, then evaluate those results and react to them, before performing any wholesale upgrades. Otherwise, one wave of effort and expense may simply lead to another, along with a sizable group of end-users in various states of disarray and disaffection.